Seeing your cute balls of fur always brings a smile to my face. Oh, they are just the cutest, my friend! I hope you have a wonderful week and a great Thanksgiving. Hugs! This is so adorable! He still found his bed even though it was covered, and laid in it! Such a cute bed! Does Goro have a a bed, too? But he just doesn't like it? We don't like it much when the workmen come in to our house. Glad you two had a safe place to nap and hide out! We're not fans of those worker humans, they are too noisy! I'm sure glad your normal has returned!!! You two are so adorable. House painting.... Ick ! We bet it looks great now though. So glad everyone made it through the painting all right. What a good idea, just get in the bed whether covered or not. See life is tough there for the fur persons! LOL ~ their own room ~ how good can it get???? The cats must not have liked all the chaos around painting! Those intruders are never fun, but always better when done. 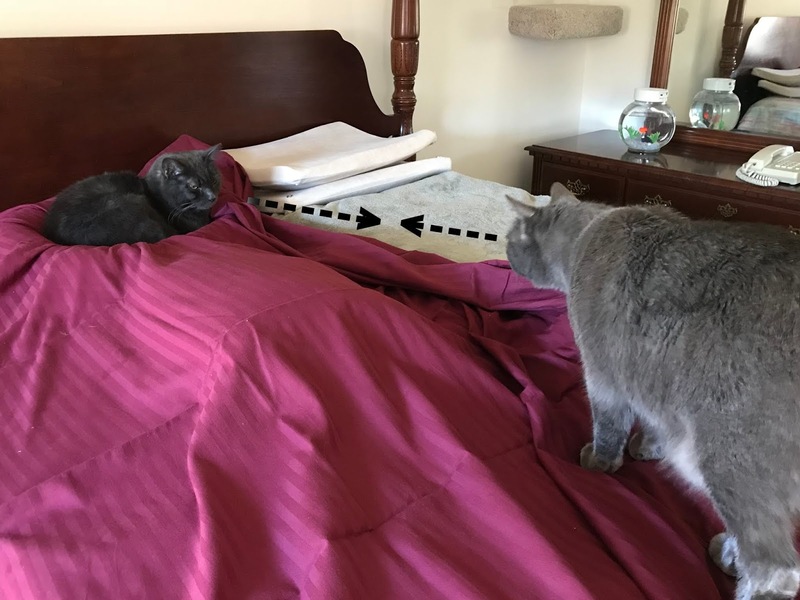 haha he knew exactly the spot no matter the sheet. a nice paint job always makes everything seem fresh! NOthing stops a kitty from using a cat bed! Niko and Goro, you two are just too adorable! Of course Niko still needed his cat bed! I'm glad the painting is done. You two boys are my absolute favorite ever and ever and ever. And I think you both and your mom know it. XXXXXXX and air whap all you want Niko and Goro San. Good for your blood circulation! ❤️😻 Love you. A few weeks ago there were painters in our house, too. We had to stay in the bedroom with the door closed...and all Wally wanted to do was go out and help them! Glad to see all is back to normal and the babies are having fun. And a very nice bed it is, too. Niko, you are too funny. The sheet didn't stop you for a second from enjoying your comfortable cat bed. Thanks for sharing the wonderful photos. Have a great day. Oh my, our kitties have been in hiding most of the time because we too had one painter doing the bathroom walls, then touching up the bedroom, like shutters and window, repairing one crack in wall and redoing that part too. Then he did touch up the shutters, baseboards and doors in office and today the hallway got done. Hope they soon will put new grout in the section downstairs where old one got scraped out. Pieter had sealed it previously with some water barrier stuff and it turned ugly brown... So that is now gone! SO happy with all the progress. Came home this afternoon from the Technical College from tutoring and found the home empty; only kitties inside with full tummy and Pieter! Tomorrow I start cleaning... a Happy Thanksgiving to ya'll! The shower door and glass wall got installed this morning... finally done. They started on October 22nd. But the threshold and safety bar need to be still done. Goro & Niko look in peaceful state. Happy Thanksgiving, dear friends. We love you! They also have a variety of sleeping places ! They are so handsome both ! Both of you are beautiful! So glad the disruption wasn't too bad, and you got a nice fresh paint job. That cat-shaped bed is really really awesome! You two are funderful!! There's no fooling Niko. He knew where his bed was hiding. We're glad you house is back to normal! Wow, your paint looks great! House painting? I dont like house painting as it leaves strong smell. But I love the after affect. The whole place look brand new. Have a great weekend, dear. You precious boys. You have my momma's heart, you know. You are so well organized! And painting it yourself. Cats are amazing. They know how to make themselves comfy. Glad the work is done now. Niko, you are a smartie! You must be glad that the painting is all done, that's great and everything must feel like brand new. Awesome.